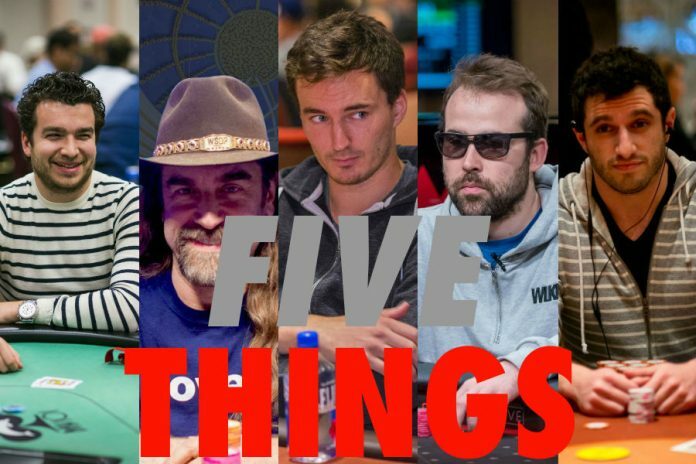 FIVE THINGS is back with talking points on Chris Moorman, WSOP POY, the Super High Roller Bowl, partypoker LIVE, and Phil Galfond's online poker site. FIVE THINGS is a column, written by PocketFives President and Editor in Chief, Lance Bradley that covers pressing topics and current events in the poker world today. It will appear periodically at PocketFives.com. Almost four years to the day that he was last ranked as the #1 online poker player in the world, Chris Moorman showed everybody that he’s still got it. Moorman beat out 1,261 other players to win the PokerStars Sunday Warm-Up for nearly $40,000. His win came just days after he picked up his 28th PocketFives Triple Crown award. Moorman’s dominance of online poker tournaments is well documented on PocketFives, but when you consider he doesn’t put in the online volume he used to, it becomes even more clear that Moorman is one of the elite tournament players in the world. There is one glaring omission on Moorman’s resume though. He’s never won a PokerStars COOP title. He has come close though. In 2009 he finished eighth in the SCOOP Main Event. A year later he finished third in a SCOOP Medium $215 NLH event. The next year he finished third in the SCOOP High $2,100 NLHE event. This year’s SCOOP schedule includes 183 events and with Moorman clearly in top form right now, this might be the year that Moorman gets one. In 2017, the orld Series of Poker revamped their Player of the Year points system. After using GPI and BLUFF scoring systems, WSOP decided to create their own system that rewarded cashing over winning more than the previous systems had. Once players realized this and saw how it worked, there was more than a few vocal opponents who were happy to make their feelings known. The WSOP apparently heard them loud and clear and has, for the fourth time in as many years, changed the scoring system. The WSOP promises that the new system will better reward deep runs and wins over building a resume full of smaller cashes through more events. There are still some players disappointed that the new system is going to reward players who can afford to play the bigger buy-in events. The WSOP Player of the Year award should reflect the best performance of the year. The award shouldn’t exclude players who don’t play the $10,000 and up buy-in Championship events, but it’s hard to consider anybody the best when they don’t post strong results against fields largely considered to be the toughest of the year. In a little over five weeks some of the best poker players in the world will be at the Aria for the $300,000 Super High Roller Bowl. With the field limited to 49 players, and 61 players putting down a deposit to play, a lottery was held for the first 30 seats in March. On Wednesday another 15 names, chosen by Aria Poker management, were released and while it includes the likes of Doug Polk, Fedor Holz, Jake Schindler and Bryn Kenney, it seems that some players are upset with the names chosen. Whether or not the German players were excluded on purpose or not, it makes no sense for the reigning Poker Masters Purple Jacket winner to not be guaranteed a seat in the other PokerCentral events at Aria. The way to build prestige for something new, such as the Purple Jacket, is to have it mean something. Allowing Sontheimer to buy-in to the Super High Roller Bowl if he wants to, would have given the broadcast team multiple opportunities to emphasize to viewers that he is the reigning Poker Masters champion. The same goes for US Poker Open winner Stephen Chidwick. PokerGO and the Aria are building something that could be very, very special in the poker world, but this feels like a real misstep. The Great Poker War of 2018 has partypoker doing their best to usurp PokerStars as the leader not just in the online world, but in the live tournament scene as well. The partypoker MILLIONS Grand Final in Barcelona last week was a showcase for exactly what they’re hoping for. The €10,300 buy-in Main Event came with a €10,000,000 guarantee which they smashed with 1,175 entrants. Before the Main Event wrapped up, the schedule also included two €25,000 buy-in events, a €50,000 event and a €100,000 event. Those events drew 88, 90, 57 and 48 players respectively. All four of those events easily surpassed their €2,000,000 guarantees with the €100,000 event prize pool more more than doubling the guaranteed amount. It’s a sure-fire sign that players at all levels are recognizing the financial commitment that partypoker has put behind their LIVE tour. Players weren’t the only ones who benefited though. Mypartypokerlive.com provided a top-tier live stream product alongside live updates, video interviews and other content. Considering the number of years they have to make up on PokerStars in the live arena, they certainly seem to be taking huge strides. In the wake of PokerStars cutting off SuperNova Elite players with no notice and the ensuing fall out from some of the impacted players, Phil Galfond began putting the wheels in motion to launch his own online poker site. He made those plans public in September 2016 and had been mostly radio silent since then. That all changed this week when Galfond announced that Phase 1 of RunItOnce would launch this summer. According to Galfond, the first phase of release will only include cash games. Multi-table tournaments and sit-n-gos are expected to be part of Phase 2, which does not have release date. In the latest update, Galfond explained his reasoning for putting out the product in various phases. Whether or not Galfond can build an online poker site, and more importantly a business that can survive the online poker market of 2018 remains to be seen, but observers who are disappointed or frustrated by the pace at which they’re moving forward are missing the point. Galfond could very easily have acquired the software necessary, quickly put in place the necessary marketing and customer service channels and picked up the necessary licensing to operate in some European and ROW markets, but the likelihood of failure would have been sky high. Instead, Galfond and his team are taking their time to build a quality product while also making sure the ancillary product offerings, such as the VIP rewards program, aren’t just cookie cutter copies of what’s out already there. In the current online poker business environment, slow and steady is bound to at least stay in the race, if not win it. DISCLAIMER: The views expressed here do not necessarily represent or reflect the views of PocketFives.com or its owners.